Imaging of the liver by trans-abdominal ultrasound and cross-sectional imaging by computed tomography and magnetic resonance imaging is standardized. There is a need to associate cross-sectional liver anatomy with the trans-luminal views of the liver demonstrated by EUS. 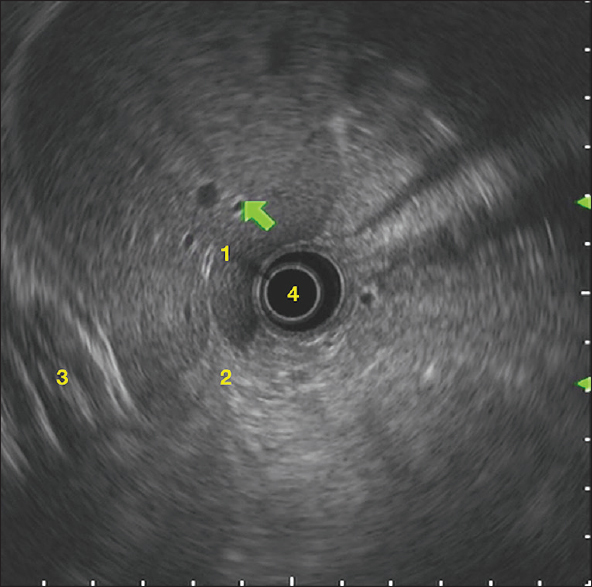 The endosonographer may need to localize liver lesions described on radiological studies during an EUS examination, and also describe the anatomical locations of small liver lesions picked up during an EUS study. A comprehensive evaluation of the liver and hilar structures should form part of a complete EUS study of the upper abdomen. In particular, liver metastasis needs to be systematically looked for in upper abdominal malignancies. Furthermore, the description of perihilar tumors needs an understanding of the hilar and intra-hepatic ductal and vascular anatomy. We have previously described segmental and vascular anatomy of the liver using a linear EUS probe. 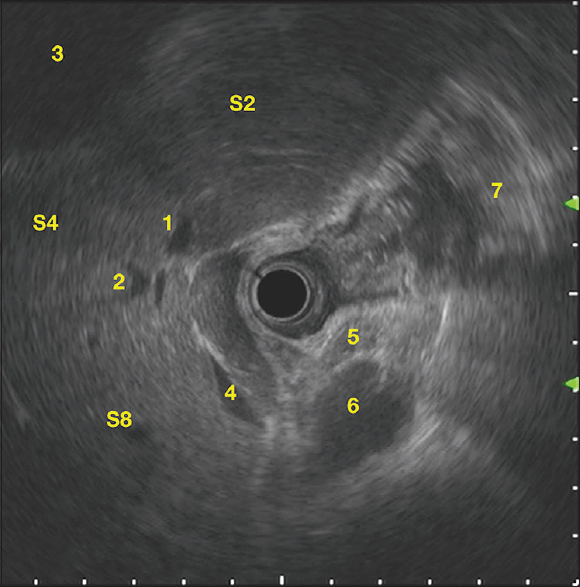 A radial EUS probe provides a different perspective of liver anatomy. Like the linear EUS probe, innumerable scan planes are possible. Real-time imaging requires “rolling-over” intrahepatic landmarks, including, portal veins (PV), hepatic veins (HV), hepatic arteries (HA), and ligaments (teres and venosum ligaments). The surface reference landmarks for liver segments include the gallbladder (GB) which straddles segment 4 (S4) and S5 and the falciform ligament which divides S3 and S4. These “EUS landmarks” have been described in our previous work. Finally, adjacent anatomical structures such as cardiac chambers and kidney can also serve as a rough guide to the abutting liver segments. 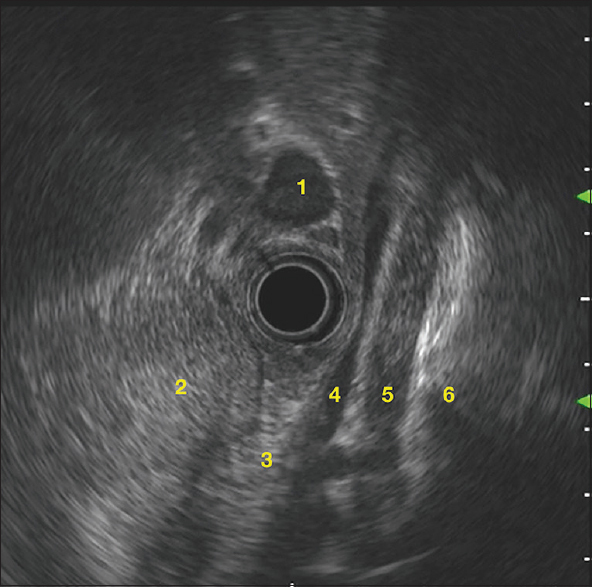 With a radial EUS probe, the liver is evaluated from three stations: (1) around the gastro-esophageal junction (GEJ), (2) gastric body, and (3) gastric antrum and duodenal bulb. In this tutorial, we will understand the anatomy of the liver with the perspective of radial EUS imaging. At the GEJ, the image is electronically rotated to display the aorta at 5–6 o'clock position on the screen. The spine is now seen behind and slightly to the left of the aorta on the screen, and the hypoechoic fibers of diaphragmatic crus between the probe in the esophagus and the aorta behind [Figure 1] and [Figure 2]. The diaphragmatic crus is the sonographic demarcation between the thoracic and abdominal cavity, with the aortic hiatus located at the level of the twelfth thoracic vertebra (T12). The right crus fibers pass behind the inferior vena cava (IVC). 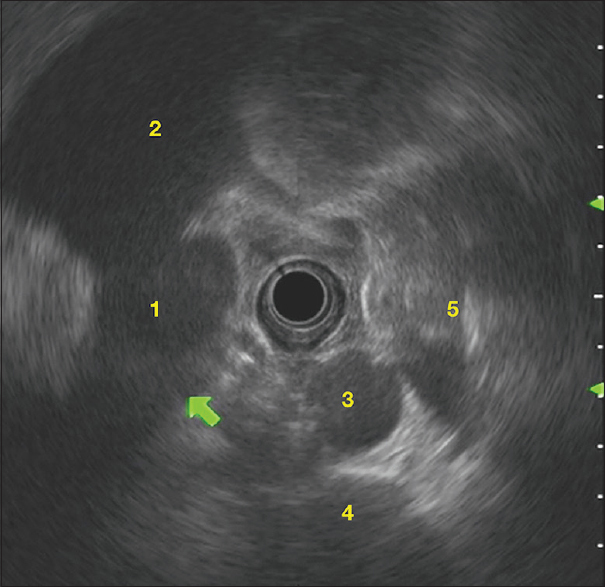 Air artifacts and fluid in the gastric fundus are seen in the right upper quadrant of the screen at this level. 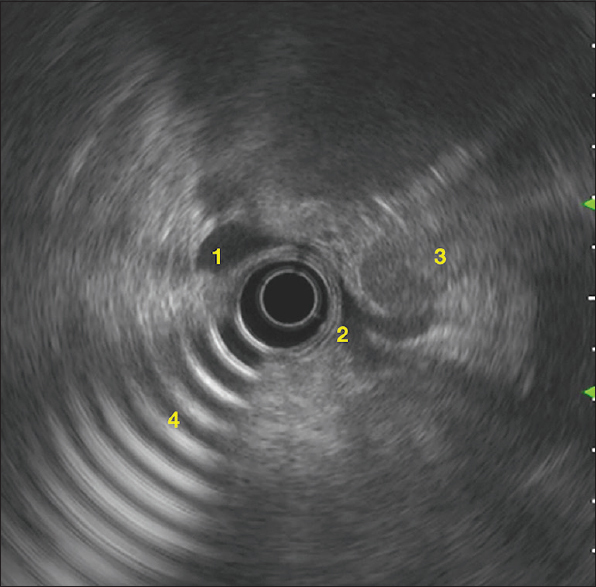 The gastric fundus can be better defined by water instillation in the gastric lumen. The spleen which is seen in the right lower quadrant of the screen defines the greater curvature of the stomach. The liver is displayed in the right half of the screen, and the gastric wall which abuts the liver is the lesser curvature of the stomach. The anterior wall of the stomach is seen superiorly, and posterior wall inferiorly. At the GEJ, the IVC is seen as a crescent-shaped anechoic structure at 7–9 o'clock position, with respiratory alterations in caliber. Slight withdrawal from the IVC leads to the right atrium, which is then seen to extend forward into the larger right ventricle [Figure 3]. Pushing the probe in and angulating the scan direction toward the liver at the GEJ (big-wheel down) from below, displays an elongated contour of the left lobe of the liver. The liver parenchyma is intersected obliquely by the radial scan plane, with the diaphragmatic muscles and the cardiac chambers deep to it. 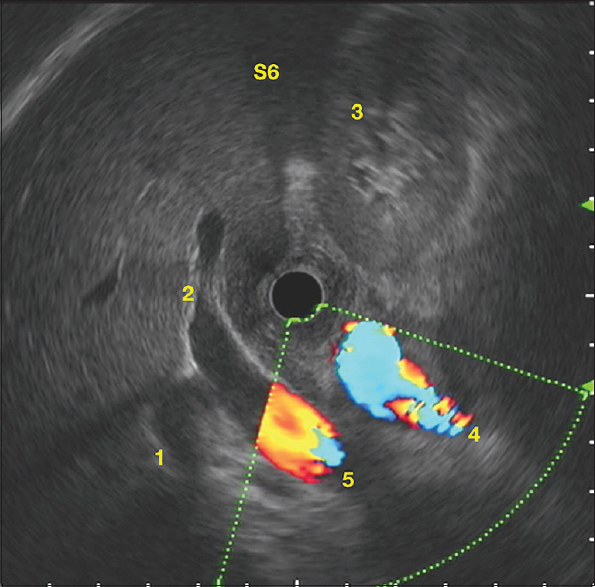 The right ventricle is seen as a large pulsating structure on top of the liver; a small part of the left ventricle can also be seen in the right upper quadrant of the screen [Figure 4]. 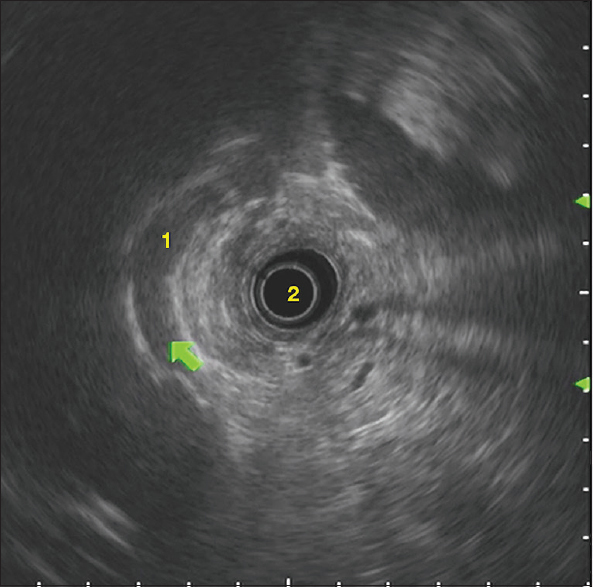 The superior aspects of the left and right lobes are well seen with the radial EUS probe. 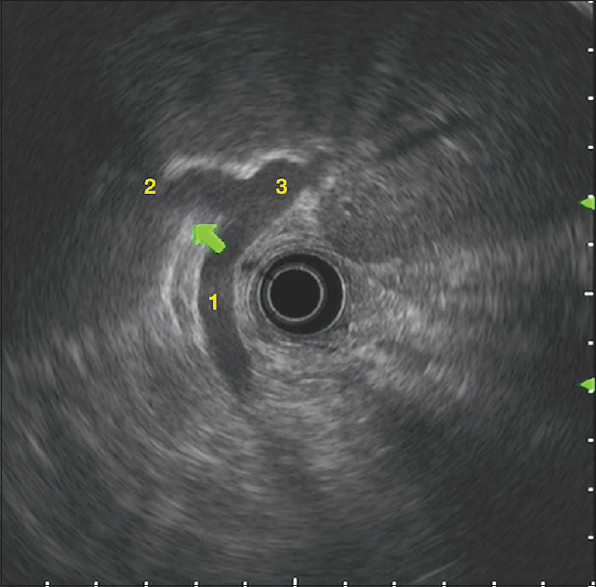 The left HV and middle HV can be seen converging at their drainage into the IVC; usually, the right HV can also be seen. The HVs can be used as a rough demarcation between segment (S) 2, the superior aspect of S4, and S8 [Figure 5]. From the GEJ and upper gastric body, lateral sector of the left lobe comprising S2 and S3 is well seen, along with a long axis display of the left HV. Since the radial scan plane can intersect the left lobe in multiple planes, it is not possible to strictly demarcate between S2 and S3. Roughly speaking, S2 is behind/toward the probe and S3 is seen more anteriorly and at a lower level, as the probe is pushed down. Since S2 is superior, as we pull up and image the top of the left lobe, more of S2 is seen. Between the cardia and the IVC is the caudate lobe. We can see the hyperechoic ligamentum venosus, demarcating the caudate lobe (S1) from S2 and S4 [Figure 2]. Slight rotation of the probe counter-clockwise and clockwise, with variable pressure on the big-wheel dial, and simultaneous in-and-out movements of the probe can display most of the lateral and medial segments of the left lobe, and the caudate lobe from the upper stomach. Like the linear EUS probe, liver hilum, and hepatoduodenal ligament structures can also be demonstrated by the radial EUS probe from the stomach. The PV confluence (“club-head”) is first displayed. 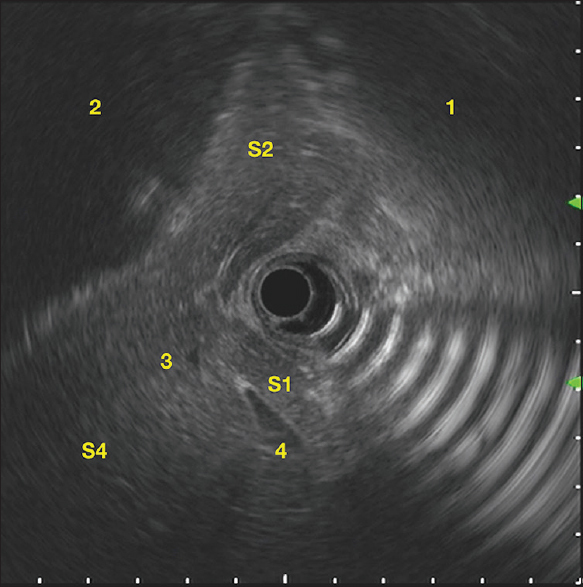 Then, the scope is rotated anti-clockwise, with upward probe pressure (big wheel down), and withdrawn a few millimeters to display an elongated contour of the PV extending upward from the portal-confluence to the liver hilum [Figure 6]. The left PV can be followed in the long axis from the PV bifurcation by continued rotation of the probe. The HA and its branches can also be traced from the “whale-tail” appearance of the celiac trunk division. 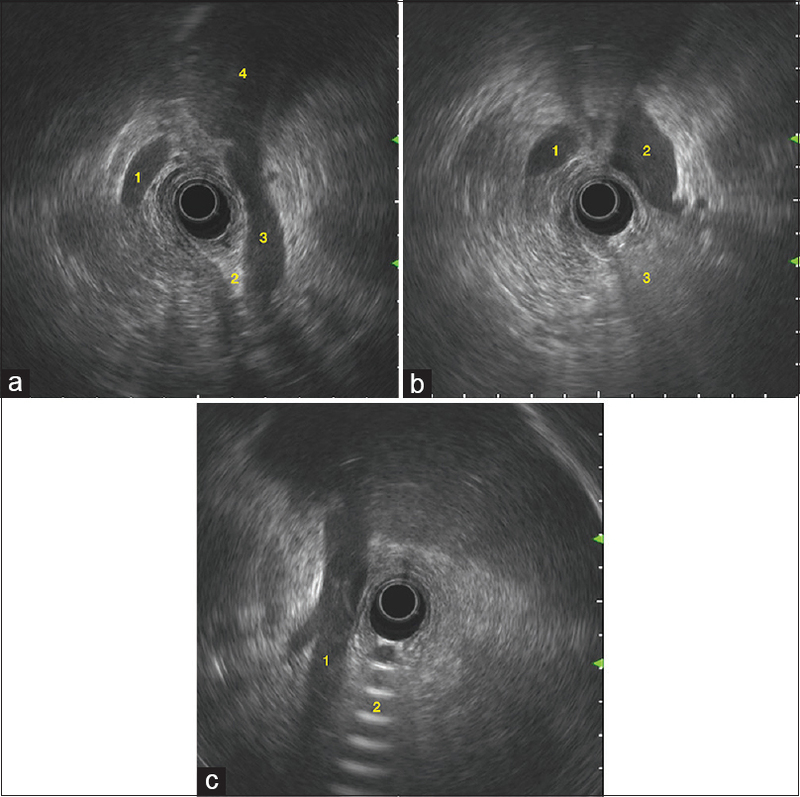 IVC can often be seen behind the elongated display of the PV trunk [Figure 7]. This imaging complements the imaging of hepatoduodenal structures from the duodenal bulb, described later. The balloon on the radial probe is inflated, and the probe is pushed up into the antrum, without crossing the pylorus. The liver and GB are seen on the left of the screen and mark the anterior wall of the antrum; the lesser curve is inferior. A cross-section through the long axis of GB at this level displays the parenchyma of S5 or S4 deep to it. The fundus of the GB is dependent in this position and is an important site to look for small gallstones, which can be missed by trans-duodenal imaging alone. 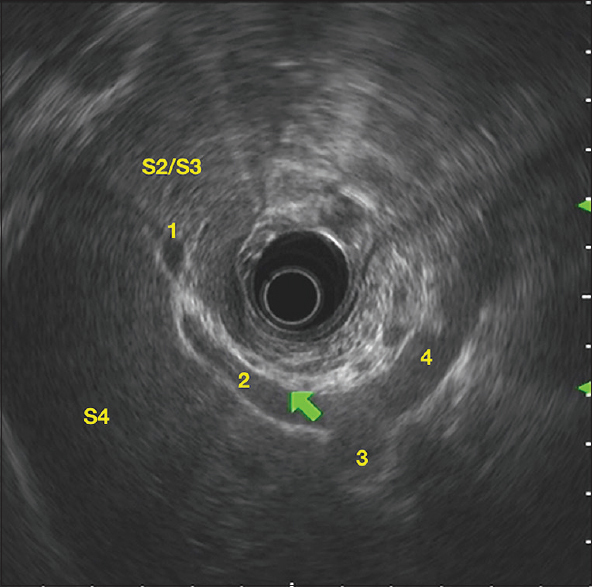 However, a distended GB can have a variable relationship to the antrum and duodenal bulb. Beyond the liver parenchyma, the thick anterior abdominal wall muscles are seen. The liver is displayed from the duodenal bulb in the upper and left half of the image. The left lobe is displayed toward the left, and right lobe in the right upper image quadrant. 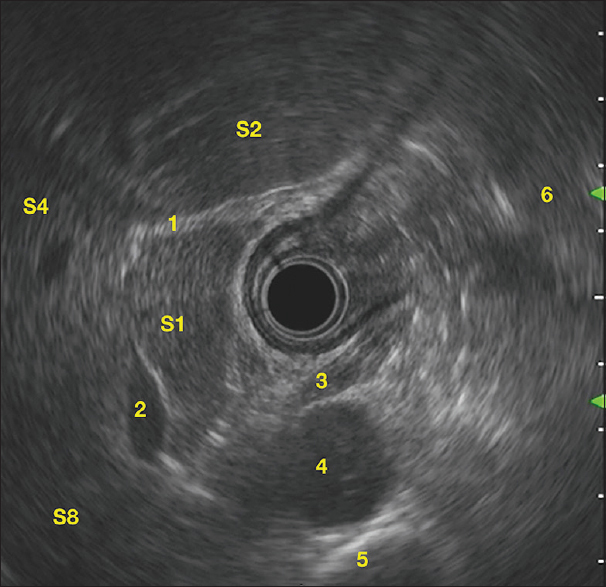 The orientation of the scan plane changes when the probe is pushed inward with maintained gastric greater-curve loop (push-position), and when the imaging is done with the probe directed down toward the descending duodenum (D2). In the former position, the probe is directed superiorly, whereas in the latter position, the probe is directed inferiorly. Thus, the 360° scan planes can have multiple orientations. The IVC can be displayed either on the right side of the probe on the screen in a long or cross-sectional orientation [Figure 8]a and [Figure 8]b, or on the left side deep to the PV [Figure 8]c depending on the probe orientation. 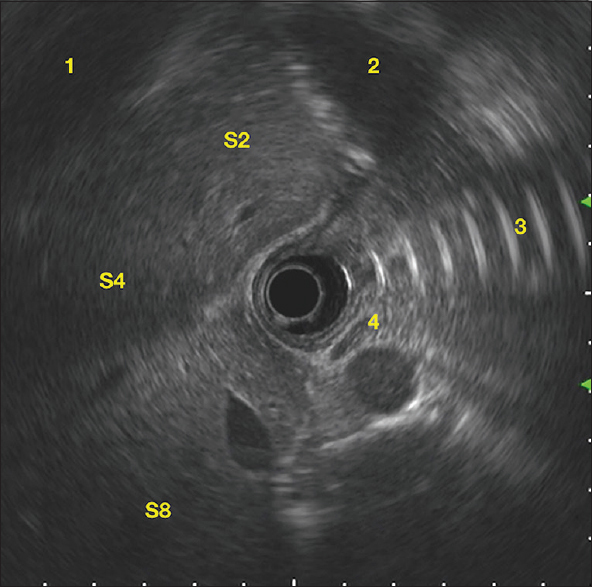 Deep to the IVC on the right side of the screen, we can often see the right kidney and right renal vein [Figure 9] and [Figure 10]. 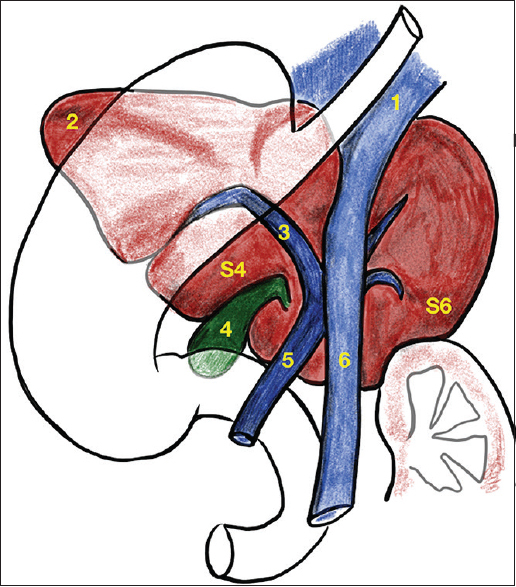 The liver segment adjacent to the right kidney is S6 [Figure 11]. The PV is always displayed on the left side of the screen deep to the pancreatic head [Figure 12]. [Figure 13] explains the variable orientation of the PV and IVC-both posterior structures to the duodenum [Figure 13]. Rotation counter-clockwise directs the imaging plane toward the liver hilum and traces the PV trunk upward. The PV divisions can be seen, with the left PV branch extending toward the left side of the screen, and right PV branch to the right. By dropping the wrist down, and continued counter-clockwise rotation, the left PV can be traced and displayed along its length [Figure 14]. S4 is seen deep to the left PV. Probe manipulation can trace the left PV to its umbilical portion (UP), where it is seen to round off. The hyperechoic ligamentum teres is seen directed to the surface of the left lobe, from the UP [Figure 15]. The inferior part of S4 (Quadrate lobe) is close to the probe. The upper part of S4 is deep to the left PV, and the anterior abdominal wall is seen further away to the left. The cross sections of thinner left HV, and its branches can be seen alongside the much bigger left PV branches. The GB is seen in the upper half of the screen and can be displayed with fundus left or fundus right, depending on whether the probe is oriented superiorly or downward [Figure 16]a and [Figure 16]b. The common HA division into the proper HA and gastroduodenal artery can be seen from the duodenal bulb. 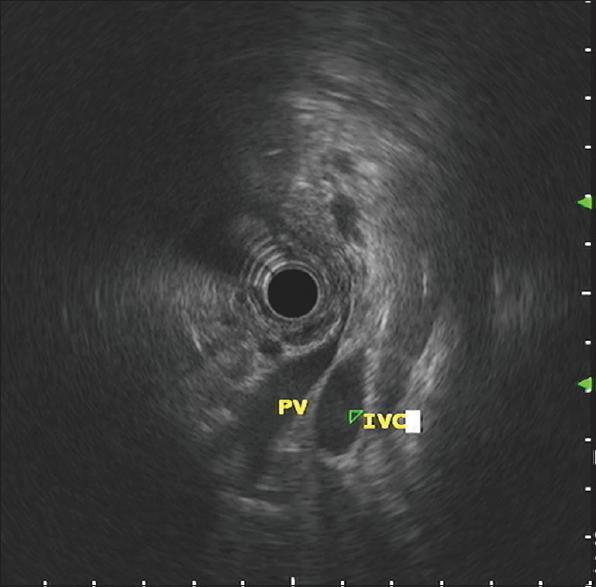 The proper HA is seen to loop upward, and the right HA can be traced between the PV and the bile duct coursing upward.